Just found this one. 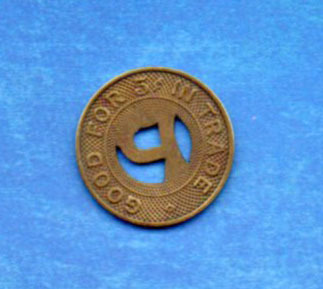 It’s the five cent version of the Pet Products token from Johnson City. The ten cent token I posted a little while ago has a diameter of 16.5 mm, while this one is 20 mm. Posted in Bob Lawrence Photography and tagged 5 cent token, Pet Dairy Johnson City TN, Pet Dairy Products trade token. Bookmark the permalink.